I have the question: How many 3rd quests does exist? Is this THE 3rd quest? And if YES: The final version? If YES: There is a problem in Level 9. If you go from the entrance up, up, you can't go back, because there is a 1-way shutter. They only way is again up, up, up, up (2x door, 1x bombable wall, 1x walk trough.) The problem begins in the room with the walk trough. If you haven't a key (and after the walk trough no bomb), you must quit the game. If you have bombs, you can go up to the stairs. There is a passageway to another room. There you can go down and there is again a locked door (no problem), but again a walk trough too. Then left to the patra, up to the next room (there is the level map). Here is the other side of the room with the locked door few rooms before. Here you can again bomb the upper wall (again a problem without bombs). But if you have bombs: Bomb, go up, there is again a stair (passageway), so we go this way. Then: You can go down. There is a room with a nice red and long moldorm (and AGAIN a 1-way shutter). The only way is down. There is AGAIN a locked door and finally the final destination, if you have no key. This is not the 3rd quest. It is the 4th quest? This is the game, that started after the 2nd quest. Why the 4th and not the 3rd quest? And: In BOTH quests there are 1-way-shutters which locks you in rooms without a change to escape, if you have no key. 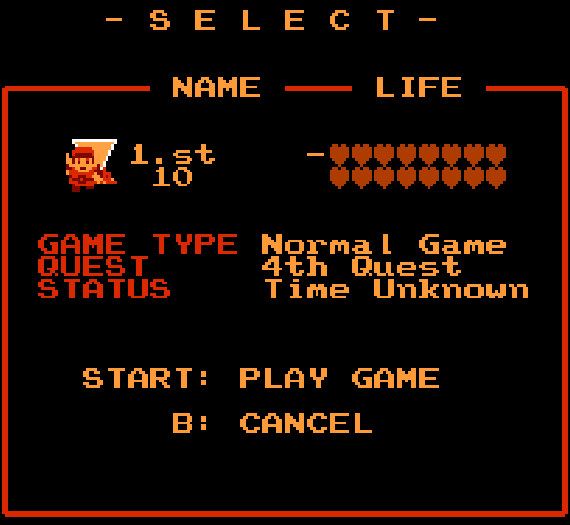 If you finish the 2nd quest with all 16 hearts, it goes to the 4th instead of the 3rd. And if you beat the 3rd without dying, you jump to the 5th. The idea was to select quests more appropriate to how you play. Do a lot of exploration, you go to the exploration-heavy quest; beat the hard one easily, you skip the easier one. I don't think any places where you can get stuck would have been fixed. There are one or two places in the NES quests where it's possible, so it probably would be considered acceptable. I've done this... and cause of this I found a room of no return (in Level 6). I've never thought about it before, but 1-way-shutter could be dangerous and bad. It should not be, that the player must save or retry a game, because of rooms without an entrance. I like Alphadawg's 3rd quest, but the 1-way-shutter problem should be fixed. That is a little bit curious. Who will watch Rambo 1, Rambo 2 and then Rambo 4 instead of Rambo 3? The only exception: Star Wars! Of course 4,5 and 6 and THEN 1, 2 and 3. In 2.55, you can disable this behaviour by setting quest_flow = 0 in classic.zmod. THat will cause the quests to run in linear order. But it doesn't solve the real problems in the quests. I found a new one in Level 9 (3rd quest). Is Alphadawg's 3rd quest holy? Or would you change something, if I tell you, where the problems are? It isn't necessary to make sensible changes. For example: The last problem I found could be repaired by changing "bombable wall" to "walktrough". 3rd.qst is the most brutal of the internal quests. That's why it's unlocked after 4th.qst if you do not have mastery of 2nd. Comparing them to films, where chronology affects the plot is silly: The second quest is not a sequel to the first quest, but Zelda II is a sequel to both. All of the quests have the same story and plot. The first four differ primarily in difficulty, and 5th adds new features from 2.50. Running out of bombs can be a problem in the normal 1st/2nd NES quests. I recall once, years ago, playing on the FDS, that I ran out of bombs in a dungeon, and being unable to get any drops, I had to do an Up+A save and continue. Anyway, we don't have unlimited rights to edit the old contest quests. They have a number of issues that we simpl aren't going to correct, because they're still the property of their creators, and distributed with ZC due to winning the contests for their time. Last edited by ZoriaRPG; 01-19-2019 at 10:29 AM. If you finish the 2nd quest with all 16 hearts, it goes to the 4th instead of the 3rd. And if you beat the 3rd without dying, you jump to the 5th.